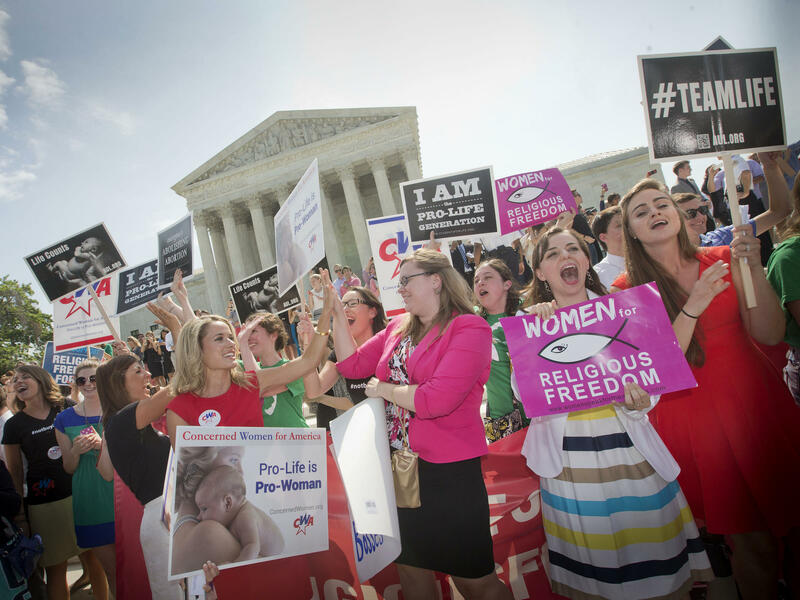 Demonstrators outside the U.S. Supreme Court in Washington, D.C., in 2014 react to hearing the court's decision on the Hobby Lobby birth control case. A federal judge in Pennsylvania has blocked the Trump administration from implementing a rule allowing employers to decline to offer contraceptive coverage on moral or religious grounds. U.S. District Judge Wendy Beetlestone in Philadelphia imposed a nationwide injunction Monday which has wider effect than a similar ruling issued Sunday by a federal judge in California. The policy was set to go into effect nationwide Monday. But U.S. District Judge Haywood Gilliam Jr. blocked the Trump administration's bid to greatly expand the number of employers that could claim the exemption from the health care law. He put the rule on hold for 13 states and the District of Columbia, which challenged the rule in court. In her ruling, Judge Beetlestone said states would be harmed by the Trump administration's policy because women who lost contraceptive coverage would seek state-funded services. The Affordable Care Act requires most companies to offer employees health insurance that covers FDA-approved birth control at no cost. But Trump has long promised employers that he would "vigorously" protect their rights to religious freedom. So the Trump administration developed rules to make it easier for more employers to opt out of the ACA requirement. The challengers "have raised serious questions going to the merits, on their claim that the Religious Exemption and the Moral Exemption are inconsistent with the Women's Health Amendment," wrote Judge Gilliam, who was nominated by President Barack Obama in 2014 to serve on the U.S. District Court for the Northern District of California. The states had argued that the new policy "cannot be reconciled with the text and purpose of the ACA — which seeks to promote access to women's healthcare, not limit it." The Women's Health Amendment is the provision of the ACA that requires employer-provided health insurance to include coverage for free or low-cost birth control. Gilliam said that if he didn't block Trump's new policy, tens of thousands of women could lose that coverage. "The law couldn't be clearer — employers have no business interfering in women's healthcare decisions," California Attorney General Xavier Becerra said in a statement applauding the ruling. "Today's court ruling stops another attempt by the Trump Administration to trample on women's access to basic reproductive care." The Trump administration amended the ACA in 2017 to protect the "conscience rights" of employers, letting them opt out of offering birth control coverage. The Trump administration's new policy was an attempt to considerably expand the previous religious-based exemptions, which applied only to religious employers. Trump's policy was immediately challenged in court. The Supreme Court's 2014 Hobby Lobby decision found that privately held companies with religious objections could refuse to offer contraceptive coverage. The 5-4 decision ruled that those companies "have the right to exercise their religious beliefs even if it means that their beliefs will impose certain restrictions on their employees," NPR's Nina Totenberg reported. Trump's new policy would also allow publicly traded companies to opt out of contraceptive coverage based on religious or moral grounds, The Associated Press reported. Judge Gilliam's ruling blocked the policy from taking effect in California, Connecticut, Delaware, Hawaii, Illinois, Maryland, Minnesota, New York, North Carolina, Rhode Island, Vermont, Virginia, Washington and the District of Columbia.